M not a huge fan of Janet but i still like her books cuz they r fun and smart reads. In collaboration with Lee, they both created a magic. They make u laugh at a very serious situations, their humorous characters, witty writing kept me enjoying The Heist. Frankly speaking, there are some twist and turns in the story and that's good actually. Gives your brains some work to do. While we keep guessing, Janet has another story to tell. When i read her book, i can sense her writing, and if I feel that its going otta track than it has to be a co-writer involved in it. Usually i dont like any author teamed up with a co-writer, but I must admit that these two have created a fire in their work. Can't wait for another book in the series. Over all its a fun read, will make u laugh, will make u think n will leave u with no other choice than to give a good review and 4 stars. 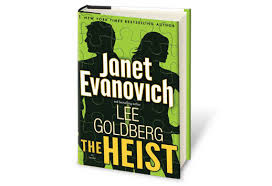 Thanks for the great review of THE HEIST!